I finished knitting my Venetian Audrey sweater this week. Unfortunately, since Emma now lives half way around the world from me (and since no one else around here could possibly fit into one of Emma’s sweaters) it will have to go unmodelled at present. This is a shame because this is definitely one of those sweaters that you have to see on to appreciate. I am going to stick it in a box and mail it to Emma and she has promised to photograph it and post up some modelled shots once she receives it. The pattern is Audrey, by Kim Hargreaves, but as I have explained in previous posts I have substantially reworked the pattern to both make it smaller and to knit it in the round. The yarn is the fabulous Madelinetosh Tosh DK, in the colour called Venetian, which is very hard to photograph. The light today wasn’t the best for capturing it as these photos make it look more purple than it is. The colour is actually like that of deep, dark, perfectly ripe cherries; absolutely delicious and rich and a very deep pink shot through with black. There are some great shaping details, which can be tricky to execute in the ribbing, but have a big payoff. In the above photo, you can see the shaping in the bust increases on the bodice and also the great detailing on the raglan sleeve and body shaping. Now for some technical details. If these don’t interest you, skip down to the next photo. I had to do a lot of fooling around with the pattern to get the ribbing to work out right when I joined the sleeves to start the yoke, and also to get the raglan shaping right. For the body, I cast off 6 stitches each side of the side markers; the crucial factor was that I wanted to end up with one purl stitch on each side of the back and front. 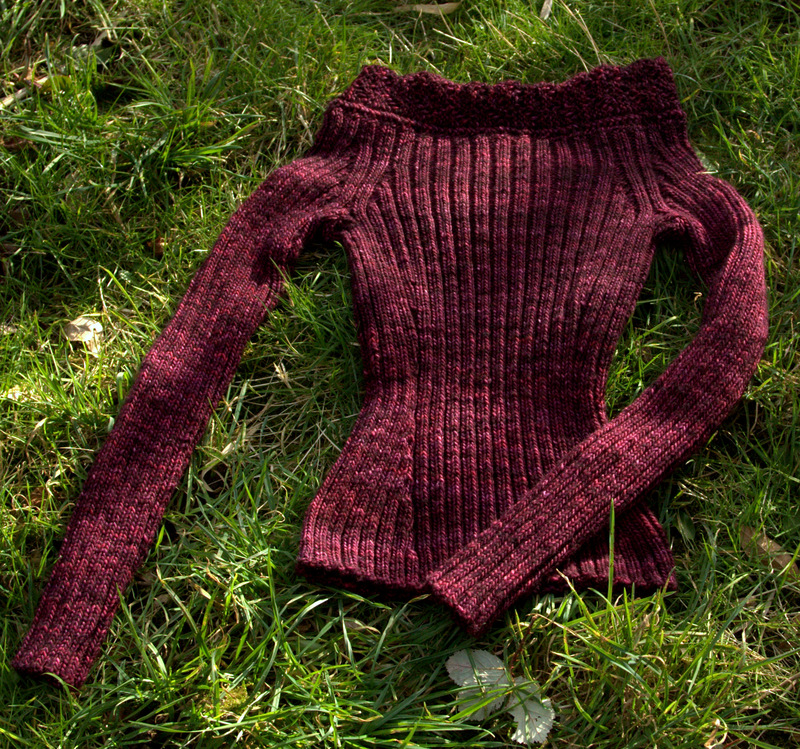 I also wanted this for the sleeves (that is, a single purl on either side after the bind off) but realized that to do this, I would either need to cast off too few or too many stitches on the sleeves, so that they wouldn’t match up with the body when it came time to graft the underarms. I had worried before (and commented on the fact previously on the blog) that perhaps I had made the sleeves too narrow. However, when making the sleeve increases, I was cognizant of wanting to end up with the K2P2 ribbing intact all the way around the sleeve, which meant that I had to make increases in groups of 4. I had made 8 increases, which didn’t seem quite enough, but 12 seemed too many. When it came time to join the yoke, however, I realized that I had not accounted for the bound off stitches under the arm. In order to bind off roughly the same as I had for the body (six each side of center, or 12 at each armhole), and still end up with a single purl on each side, I needed to have made more sleeve increases. So, I ripped out 6 inches from each sleeve, and reknit them, adding two more sets of increases for a total of 10 sets (63 stitches). I was then able to bind off the center stitch, plus 5 to each side, making a total of 11 stitches bound off for each sleeve. Note that this had the side effect of solving the issue of the sleeves being too tight, by adding an additional 4 stitches to each sleeve. Then I joined the sleeves to the body, placing a marker at each join, so that there were four markers, showing the positions of the raglan lines. Since both the body pieces and the sleeves were edged with a single purl stitch, once they were combined, I had a beautiful K2P2 all the way around. 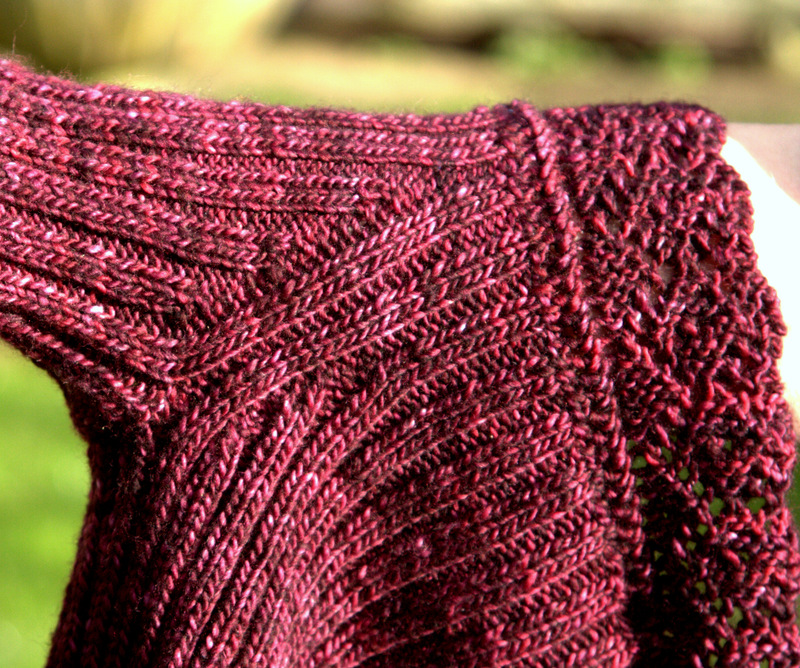 I worked these two rows 8 times, and then four times making the decreases only on the sleeve edge of the raglan edges. This left me with 160 stitches. 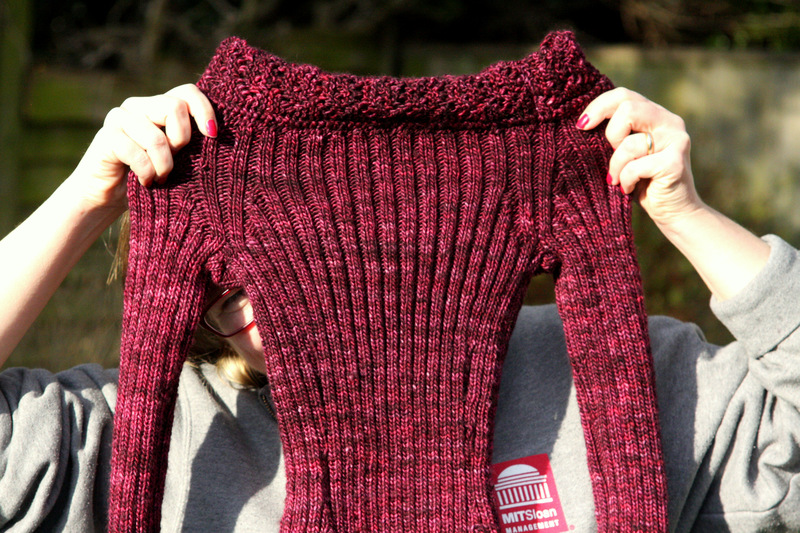 Aren’t those raglan shapings beautiful? The lace is knit separately in a long strip. It is a garter stitch lace pattern with an alternating stitch count (which accounts for the gently scalloped edges). It has a 12 row repeat. I found that one pattern repeat of the lace, when slightly stretched, fit across 8 stitches of the ribbed yoke, also slightly stretched. Since I had 160 stitches around the yoke after the raglan shaping, the math worked out perfectly! I made 20 repeats of the lace pattern. The only finishing required was to sew the lace around the bodice, and sew the stitches under the arm. And voila! The only remaining question is whether to block it. 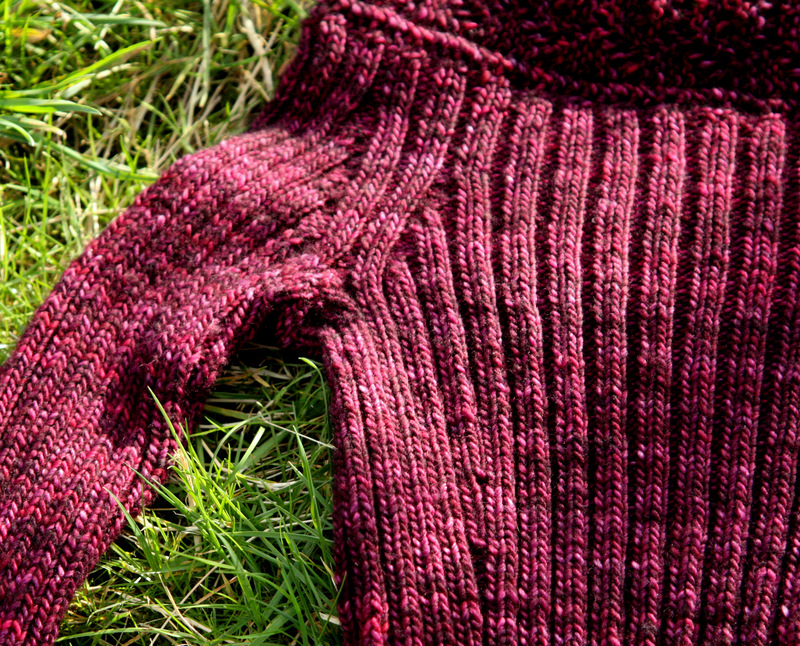 I am thinking no – I don’t normally block ribbing, and as this whole sweater is ribbed, I’m not sure it needs a block. I think that I shall just lightly steam the lace, pack it in a box, and ship it to Emma. This entry was posted in Finished Project, Main and tagged Audrey, Kim Hargreaves, Knitting, Madelinetosh DK, Venetian Audrey by knitigatingcircumstances. Bookmark the permalink. Absolutely gorgeous! Looking forward to seeing Emma model this masterpiece. I’ll likely never knit this pattern, but I really enjoy reading about your decision-making process, the modifications and what you did to make all the elements come together.